You are a 14 year old named Todd Gack*, wearing a t-shirt. You wake up in a bed in an upstairs bedroom in your grandparents' farmhouse to the sound of music. Through the window, you see your grandpa drive up the gravel driveway in his old Ford. Your jeans are on the desk and your boots are on the floor. It's summer, and all you're interested in right now is finding out where that music came from. When examining some objects, a picture is displayed without any text description. The response to the CREDITS command is also just a picture, although there is text in it. When attempting to travel in an invalid direction, a standard error sound-effect is played instead of a text message like "You can't go that way." The game includes a hunger daemon; you'll get hungry every 400 turns. Strangely, eating the plate of eggs doesn't satisfy your hunger. Conversation is ask-tell, but very few topics are understood by the NPCs. Some sloppiness in the coding. The initial room has no name, exits from locations are often omitted, some room descriptions are "painted on", the grandmother is not listed in the room she's in. The game earns a "Cruel" rating because of an unexitable room bug. The code uses a score. The maximum score is 100. There is no status bar. The name "Þe|v¥n" on the kitchen table is a reference to Delvyn (Santoonie Corporation; 2003; TADS 2). 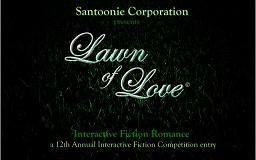 Lawn of Love (Santoonie Corporation; 30-Sep-2006; TADS 2). IF Comp 2006: 35th place of 43 games. Download Lawn%20of%20Love.gam from the IF Archive. Lawn of Love (archived) - at Baf's Guide. Lawn of Love - at IFDB. Lawn of Love - at IFReviews.org.